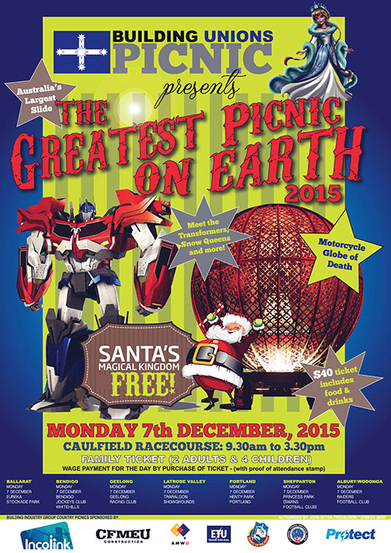 ANNUAL PICNIC DAY IN MELBOURNE! This famous Picnic day is celebrating the union of all the tradesmen out there, in Melbourne, Victoria. It has existed ever since 1976 where BWIU, BLF, Bricklayers, Painters, Plasterers, Plumbers, Slaters and Tilers and the Amalgamated Society of Carpenters & Joiners, put their heads together and planned a trial joint picnic day, which was first held at the Dandenong Showgrounds. This union continues to grow! The first ever 2 events for the Unions Picnic Day was such a big event, they had to hunt for a larger venue, to add more features such as rides, as well as a bigger space for a larger amount of people. And even to this day (after 35 years) this day is just continues to expand and grow. Enjoy company with many families and reminisce with those who are working in other different trades to you. Enjoy a day of fun an entertainment with your families taking part in festivities such as sprints, sack races, relays, even get your face painted. Grab food and drink and be in company with thousands of people. What better way to get the community together? !